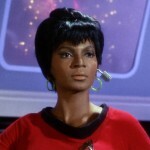 December 28, 1932 Grace Nichols (Nichelle Nichols), actress, dancer and singer, was born in Robbins, Illinois. Nichols danced in Chicago, Illinois with the College Inn Revue around 1947 and toured the United States, Canada, and Europe as a singer with the Duke Ellington and Lionel Hampton bands in 1950 and 1951. In 1966, Nichols was cast as the communications officer Lieutenant Uhura aboard the USS Enterprise in the television series “Star Trek,” a role she played until the series was canceled in 1969. She also co-starred in six “Star Trek” motion pictures, the last being “Star Trek VI: The Undiscovered Country” (1991). Former NASA astronaut Mae Jemison has cited Nichol’s role as her inspiration for wanting to become an astronaut. After the cancellation of the television series “Star Trek,” Nichols volunteered for a special project to recruit minority and female personnel for the National Aeronautics and Space Administration. Those recruited under this program include Dr. Sally Ride, Colonel Guion Bluford, Dr. Judith Resnick, and Dr. Ronald McNair. Nichols continues to act, appearing most recently in the film “Tru Loved” (2008). She has also released two albums, “Down to Earth” (1967) and “Out of This World” (1991). Nichols published her autobiography, “Beyond Uhura: Star Trek and Other Memories,” in 1994.